Meteorologists and residents are reporting flashes of lightning and booming thunder from the Philadelphia area to New York City. Experts say the unusual phenomenon is caused by shallow layers of rising, unstable air. The nor’easter is expected to intensify as it moves up the coast, with snowfall rates up to 3 inches per hour. The National Weather Service is warning of a treacherous evening commute. Officials in at least two states are banning big rigs from major highways and warning other drivers to stay off the roads as a late-winter storm bears down on the Northeast. Tractor-trailers have been banned on the New York State Thruway from the Syracuse area to New York City. Democratic Gov. Andrew Cuomo says state troopers will ticket any violators. In Pennsylvania, all commercial vehicles are banned from interstates 380 and 84, while empty straight trucks, double trailers and other types of commercial carriers have been ordered off several other major interstates including 78, 81 and 80. Officials have also reduced speeds to 45 mph. Motorists are being urged to avoid travel unless it’s absolutely necessary. Massachusetts officials are gearing up for the second potent nor’easter in less than week, and anticipating widely different effects around the state. Gov. Charlie Baker says Wednesday’s storm is likely to bring more than a foot of snow to the Berkshires, scattered power outages and “minor to moderate coastal flooding” in communities still recovering from Friday’s damaging nor’easter. State highway officials are warning of treacherous driving conditions in through the afternoon and evening hours, with snow falling at a rate of 2-to-3 inches an hour in some areas and causing whiteout conditions. Boston and coastal communities are expected to get mostly rain. Baker noted that tides are not as astronomically high as at the height of last week’s storm, but could still bring additional flooding woes. 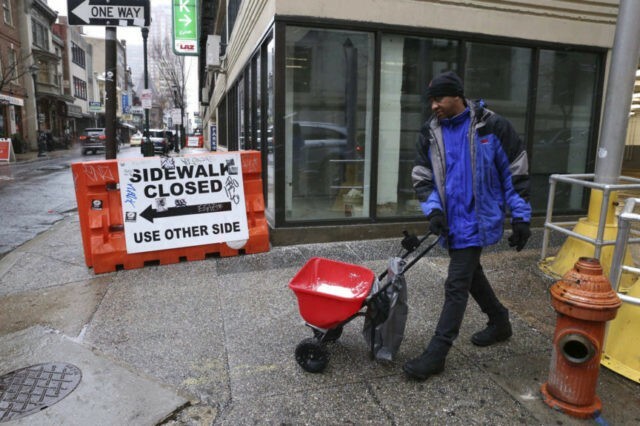 Connecticut state employees are being sent home from work early Wednesday ahead of a storm that’s forecast to drop as much as a foot of snow in parts of the state. Nonessential state workers are being dismissed in staggered phases beginning at noon to reduce the risk for traffic problems as commuters head home from Hartford. Democratic Gov. Dannel P. Malloy says the idea is to ensure people are off the roads by rush hour, when the snowfall is expected to be at its heaviest. Nonessential second-shift state employees are being told not to report to work Wednesday evening. The latest nor’easter to hit the East Coast is already causing some travel headaches. Hundreds of flights across the region had been cancelled even before the snow started falling Wednesday due to the dire weather forecasts. And more cancellations are expected as conditions deteriorate during the day. The morning commute was going smoothly in most areas Wednesday, as the storm had not yet kicked in to gear in most spots. But motorists are being urged to avoid travel if possible so crews can treat and clear roadways as needed. Amtrak canceled some train service Wednesday, and commuter rail trains in Philadelphia are operating on a weekend schedule. A wintry mix of snow and rain is falling along the East Coast as another nor’easter takes aim at the region. The new storm is expected to drop more than a foot of snow in some interior areas on Wednesday. Pennsylvania’s Poconos Mountains and parts of Massachusetts could see up to 18 inches. Another nor’easter is threatening communities up and down the East Coast, closing schools and city offices and causing outage concerns for utility customers still trying to bounce back from last week’s storm. Heavy, wet snow and gusting winds could take down trees and snap power lines already weakened from last week’s storm. More than a foot of snow is forecast for some interior areas. Pennsylvania’s Poconos Mountains and parts of western Massachusetts could see up to 18 inches.